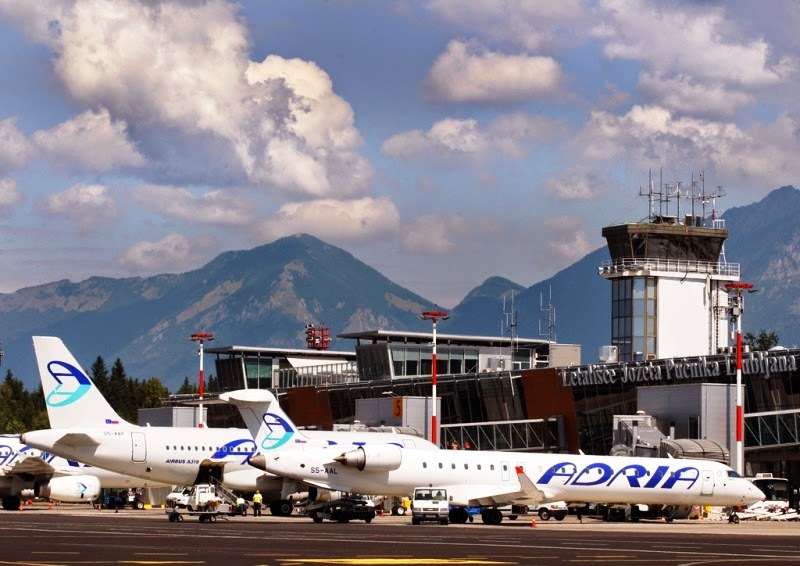 Adria Airways has said its new flights from Ljubljana to Berlin and Stockholm, which are to launch next year, as well as some existing routes, could be in jeopardy after the new operator of Ljubljana Jože Pučnik Airport, Germany’s Fraport, revealed plans to increase fees for the Slovenian carrier. Adria’s CEO, Mark Anžur, has warned there will be no new routes from Slovenia next year if Fraport goes through with a planned 10% fee hike. The carrier currently pays ten million euros in airport fees, meaning it would have to provide an additional one million euros in 2015. Mr. Anžur notes that in such a case, Adria’s restructuring program over the past two years will have been in vain, adding that Fraport’s policy is short-sighted. Furthermore, the CEO said the airline was trying to reverse the trend of Slovenians using neighbouring airports, rather than Ljubljana, and would like to work together with Fraport to increase passenger numbers. The CEO of Slovenia’s national carrier conceded that the airline’s results in 2014 will not be as good as originally expected. The airline will break even by the end of the year but no significant profit is likely. Mr. Anžur says the reason for the poorer performance comes as a result of strong pressure to reduce ticket prices. Revenue per passenger at Adria is down 10% this year. On the other hand, the airline will see its passenger numbers improve 8%, while lower fuel prices have also helped to reduce expenses. Meanwhile, Adria yesterday officially announced the opening of its newest base in Lodz, in central Poland, in 2015. During the summer season, Adria will operate twelve weekly flights from Poland’s first largest city to Munich. There will be a morning and an evening flight every day apart from Saturday. In addition, the Slovenian carrier will launch six weekly midday flights from Lodz to Amsterdam, starting March 29. Further flight details can be found here. The airline will base a Bombardier CRJ700 in the city. Earlier this month, Adria announced it was also launching flights from Tirana to Brussels and Paris next year, in addition to its new routes from Ljubljana to Berlin and Stockholm from April 23. Why does every new operator increase fees? Same thing happened in ZAG. what will happen if the have to pay at BEG? they have to collect more Money as the invest! in a very short time! New fees are for new uniforms. How are Croatia Airlines and Adria Airways ticket prices compared to Air Serbia? If you fly from LJU with ASL instead JP or from ZAG with ASL instead OU than ASL is cheaper to some destinations, but if you fly from BEG than tickets to some destinations are the same price or expensive. if you would subsidise Adria then with its operation in LJU but not in TIA etc., can't understand your point of view? Imho new bases with new aircraft is a question of economies of scale @ ADR but not subsidising by LJU. It seems someone wants no further growth @ LJU by ADR. I think that expanding in Lodz is a good idea. I think that flying to Amsterdam is a really interesting move, especially as the route could be covered via Munich. I guess they need to compete more effectively against direct flights to EIN. Airport has a runway that is 2,400 meters long and 45 meters wide (class 4C). It is designed to handle 270,000 passengers per year! Eto vam sad Fraport pazite da on licno ne unisti ADR u LJU. Let's be serious. Adria annual income is around 150M €. 10% increase means that they will pay 11M € instead of 10M €. This won't push AA over the edge, other things will. It will be sold anyway. You don't get it. They are not protesting because they can't afford but rather because they do not want Fraport to think they can just keep on increasing them without any consequences. The problem you're talking about is non existing. Fraport people aren't idiots. There is still a big mess in slovenian aviation sector. All that state financial help really distorted the market and we will need some time to fix it. If you are on the break even point of the profit this would mean loss. Adria is just about to become profitable. This is the main reason I think. I agree 100%. For an established company if you are not making money now (at $70 oil) you have some serious problems that you have to deal with. In 2012 and 2013, on average fuel was 33% of the airlines costs (according to IATA). With $70 oil their forecast for this year is 2.4% margin on $18B profit (in 2013 it was 1.6% on $10.6). Of course other costs play the role but oil is the big one you can't control. OT: air serbia flight to tirana today was operated with a320!??? Few days ago the Tirana gate (C3) was completely full, the queue was extending well into the corridor. Tirana left with around 50 passengers and came back with 149. Most likely there was a large group transferring in Belgrade. Izgleda da je istina da ASL ne moze prodavati karte iz ZAG dalje od LYBE. Tako sam ja razumeo Gospodina Vucica veceras na Pinku. Izgleda se uplasio CTN lidera u regionu. Само је питање времена када ће то бити решено, ако већ није. Ja se nadam da je reseno zato sto je to podmuklo to cak nije uradila ni LH u FRA niti OS u VIE. Нити OU у Сплиту или Дубровнику... На крају крајева, зашто не ураде исто Туркишу. То је јадно, нема друге речи. Од уласка Ер Србије ће највише настрадати Туркиш а не OU, због ког је иначе сама Кроација морала да укине лет за Истанбул, па ви видите кога они штите. Карте се иначе и даље увелико продају. smisno, da Hrvate stite Turce. Ne stite oni TK sta boli uvo HR za TK. Nego pokusavaju da odrze CTN jos malo u zivotu ali to nije uredo kako se to pokusava. @INN-NS, jel u redu kako Er Srbija ne placa usluge na Aerodromu Beograd, kada vec toliko zagovaras postenje i pravdu. Dobro ako ne placaju nije uredu meni ne smeta kao poreznom obavezniku to da snosim. Ali niko ziv nezna sta oni placaju ili neplacaju a mozda ne placaju ni kerosin u AUH ni to niko nezna i sta sad to je nesto sasvim drugo od toga sto je podmuklo. Sto QR ne zabrane to isto nista nisu stekli svojim parama sve placa drzava Qatar da sve ijednu nabavku aviona. Od nas isto niko nezna sta isto CTN placa po malim HR aerodromima. Sto u ni jednoj drugoj EU zemlji ne zabrane letove ME3 i Austrija ce da odobri 14 nedeljni let EK. se placaju usluge u BEG u devizama? @Anonymous 11.39 Srbija na taj nacin isplacuje svoj deo prema ugovoru sa Etihadom, kroz usluge jer kesa nema, sta je tu sporno ili lose? @INN dete, hitno poradi na svojoj pismenosti, bez uvrede. Neshvatam to kao uvredu posto idem u Austriji u skolu pa ne znam bas pravilno pisati Srpski. To ti nije opravdanje, kao sto blejis po internetu prelistaj malo gramatiku srpskog jezika. INN majke ti ti nisi poreski obveznik ni u Austriji jer se puno prebalav, a kamoli u Srbiji, pa kako onda "tebe kao poreskog obveznika" nešto može ili ne smetati. Dobro ja ne placam placaju moj iroditelji to je isto. Jel zna iko ovde neku drugu rec se balavac vise je dosadila. According to airserbia.com Vienna will receive the Boeing on 3/14 weekly flights starting from next month. Taj avion jeste prestar pa i jedino moze dobro doci na Regionalnim Routama. Ja neznam sto vas sad niko nije napao sto ste to napisali a ja kad napisem kad ce doci neki avion odma se raspali rafal po meni. Ја се иначе не упуштам у препирке са тобом али вероватно те нападају јер често знаш да будеш дрзак и иритантан. Можда када би знао мало да искулираш неке људе не би те сви нападали. А што се тиче регионалних рута, камо среће да је тако. Б733 лети с времена на време и за Тел Авив, Лондон, Диселдорф а пре неки дан је чак отишао и за Париз. YU-AND, ANI and ANK seem to be the ones in active service lately. They seem to be the only ones as well in Aviolet livery. The past 10 days theyve been doing TGD (6x), SKP (5x), STR (3x), FCO, WAW (2x), MXP, BRU, ARN, SKG, DUS, AMS and TIV (1x). I did see YU-ANJ come in from ZRH last month, which is all white. YU-ANJ is in the best shape and it was the only one to be exclusively used on European routes this summer. That's why it never got the Aviolet livery. Neka koriste sve avione ,733 neka guraju koliko mogu dok ne rese pitanje sa manjkom aviona u floti( u stvari sa 4 733 nisu).